"An important aspect of the work is that the group of patients participating in our research are hospitalized in a rehab and their consumption of addictive drugs is controlled, ensuring that they do not drink alcohol. Therefore, the holding phase can be followed closely. ", Dr. Canals. "Another differential characteristic of this study is that it has been performed in parallel in a model of Marshal Sardinian rats, with preference for alcohol, which makes it possible to monitor the transition from normal to alcohol dependence in the brain, a process that does not is possible to see in humans "explains Dr. Silvia De Santis, who led the study. The injuries observed during the withdrawal period mainly affect the right hemisphere and the frontal area of ​​the brain, versus the conventional idea that the microstructural changes begin to return to normal values ​​immediately after alcohol withdrawal. 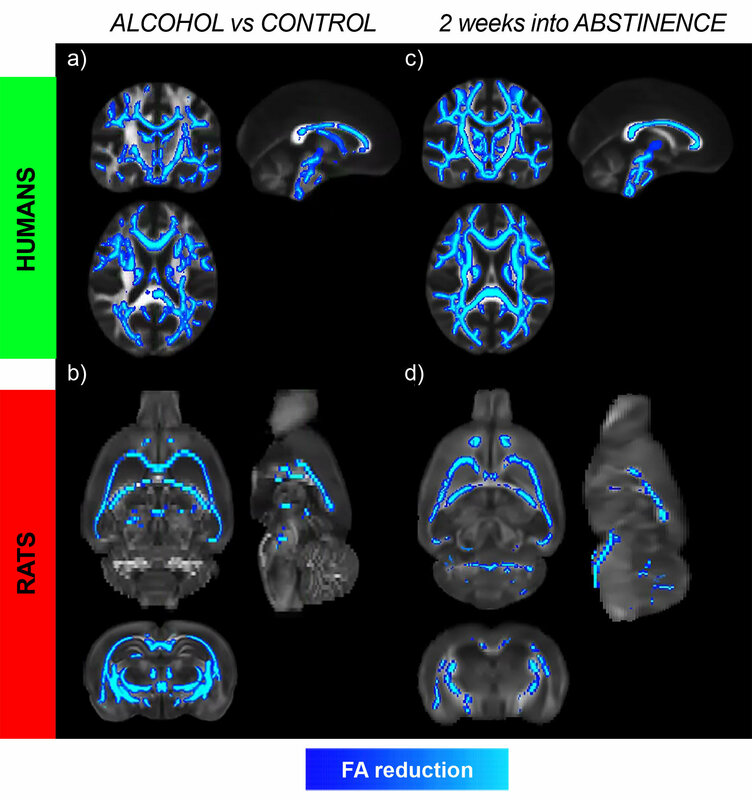 With alcohol consumption "there is a generalized change in the white matter, that is, in the set of fibers communicating different parts of the brain. The changes are more intense in the corpus callosum and fimbria. The corpus callosum is related to the communication between both hemispheres. Fimbria contains the nerve fibers that communicate with the hippocampus, a basic structure for the formation of memories, nucleus accumbens and prefrontal cortex, "Dr. Canals. The core accumbens are part of the brain's reward system and the prefrontal cortex is essential for decision making. The researchers from Alicante and Germany will now try to characterize the inflammatory and degenerative processes independently and more accurately in order to investigate the development of the early-stage phase in people with alcohol problems.